Infrared thermal imaging is an advanced, non-invasive technology that allows the inspector to show clients things about their homes or buildings that can’t be revealed using conventional inspection methods. For something as specialized as a thermal imaging inspection, it’s critical that the information presented meets the clients’ needs for information they can use and act on. Home Inspector Brampton explain the limitations of thermal imaging, including the fact that, as with any type of inspection, it can’t predict future conditions. However, a roof that is experiencing moisture intrusion which has been detected through thermal imaging will very likely lead to serious structural issues, if left unaddressed. Explain the capabilities of thermal imaging and how it can benefit. An infrared inspection can identify and document moisture intrusion, energy loss, and even unexpected hot spots. * Heat loss and air infiltration in walls, ceilings, floors, windows, and doors. * Damaged and/or malfunctioning radiant heating systems. * Broken seals in double-paned windows. * Water and moisture intrusion around penetrations and at the foundation and building envelope that could lead to structural damage and mold. * Electrical faults before they cause a fire. 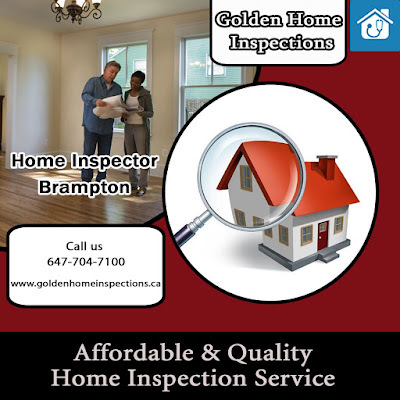 Additionally, based on the color gradients that thermal images provide, Brampton Home Inspector can locate the issues effectively. A Home Inspector is a professional who will conduct an inspection of the general condition of the home. A golden home inspection will assist a buyer in understanding exactly what they are about to acquire. A home may look move-in ready, but an inspector will cover features of the house such as electrical wiring, plumbing, roofing, insulation, as well as structural features of the home and may unveil issues that are not noticeable to the buyer’s eye. As a buyer, you are making a vast investment, and it is important to understand exactly what you are purchasing. To know more about home inspection visit www.goldenhomeinspections.ca.